Rise and shine campers, It’s Groundhog Day! It really is and we couldn’t resist the temptation to write about the 1993 cult movie that practically popularized this holiday. So, we found some awesome facts, photos, we also came up with some pretty obvious jokes that we can use during the day and just hope that we would not have to repeat writing this entire article tomorrow (see, here is the first one). So you can play Sonny and Cher’s “I got you babe” and enjoy in the facts and photos below. 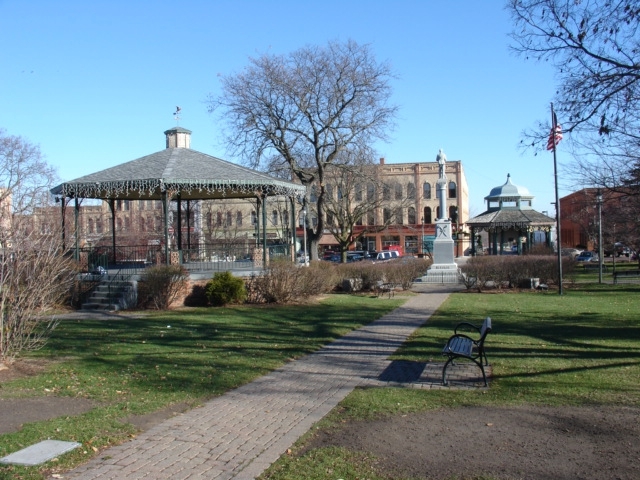 1.Groundhog Day was not filmed in Punxsutawney. 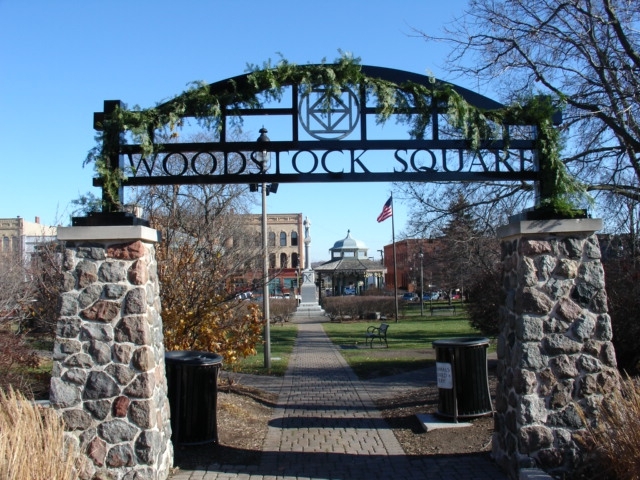 The filming took place in Woodstock, Illinois (just 45 miles from Bill Murray’s hometown of Wilmette). 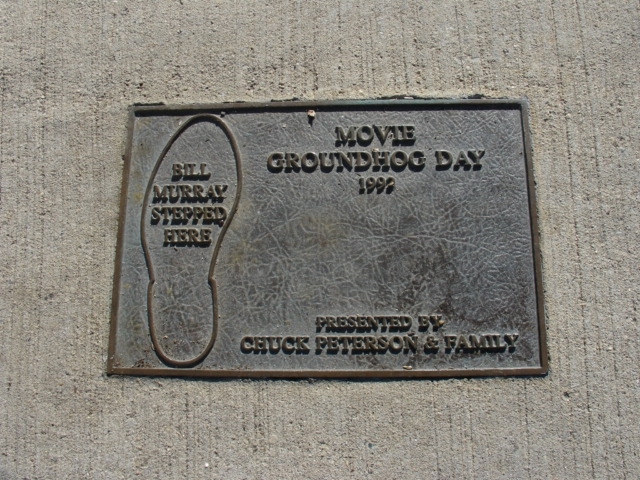 There is a small plaque that reads “Bill Murray stepped here” on the curb where Murray continually steps into a puddle. There is another plaque on the building wall at the corner that says “Ned’s Corner” where Bill Murray was continually accosted by insurance salesman Ned Ryerson. 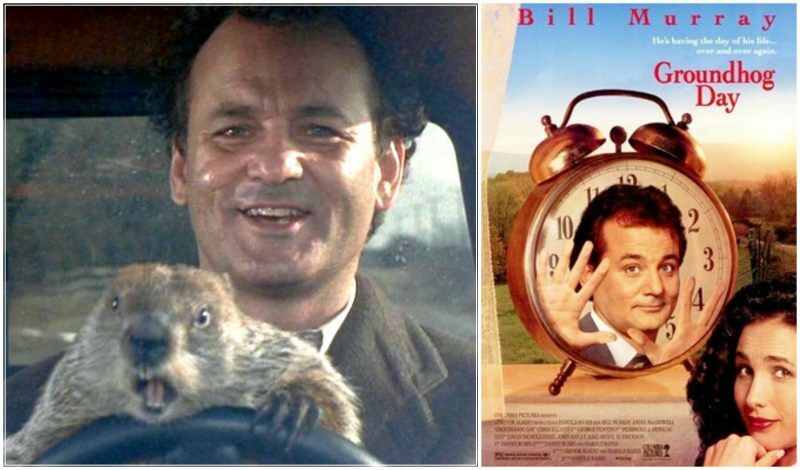 2.According to the website Wolf Gnards, Bill Murray spends 8 years, 8 months and 16 days trapped in Groundhog Day. Another website, claims he was trapped 12,403 days, just under 34 years, in order to account for becoming a master piano player, ice sculptor, etc. 3.Bill Murray was bitten by the groundhog twice during shooting. Murray had to have anti-rabies injections because the bites were so severe. 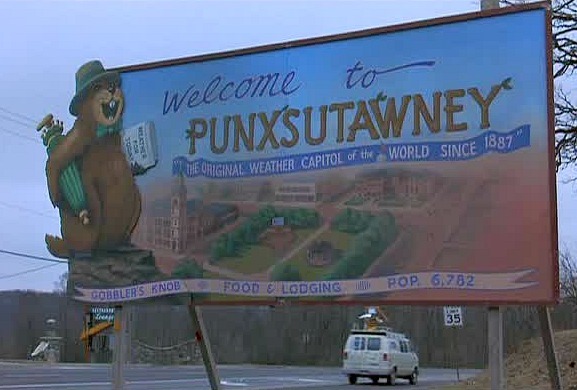 4.Since the film’s release, the town of Punxatawney has now become a major tourist attraction. 6.Bill Murray was offered a spit bucket for the diner scene where he gorges himself on pastries but he refused. The angel cake, in particular, caused him to feel sick soon after. 7.The scene where Phil picks up the alarm clock and slams it onto the floor didn’t go as planned. Bill Murray slammed down the clock but it barely broke, so the crew bashed it with a hammer to give it the really smashed look. The clock actually continued playing the song like in the movie. 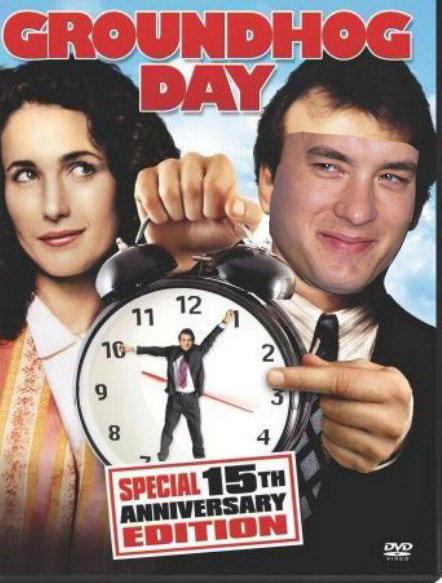 8.Bill Murray was undergoing a divorce at the time of filming and was obsessing about the film. He would ring Harold Ramis constantly, often in the early hours of the morning. Ramis eventually sent writer Danny Rubin to sit with Murray and iron out all his anxieties, one of the reasons why Murray stopped speaking to Ramis for several years. 9.Phil at the piano teacher’s house, when he is fumblingly playing Sergei Rachmaninoff’s “Rhapsody on a Theme by Paginini”, is actually Bill Murray playing. He does not read music, but he learned that much of the song by ear. Sergei Rachmaninoff’s “Rhapsody on a Theme by Paginini”, specifically its 18th Variation, was also used in another time fantasy movie, Somewhere in Time (1980). 10. In one scene, Connors throws himself from the bell tower of a high building. 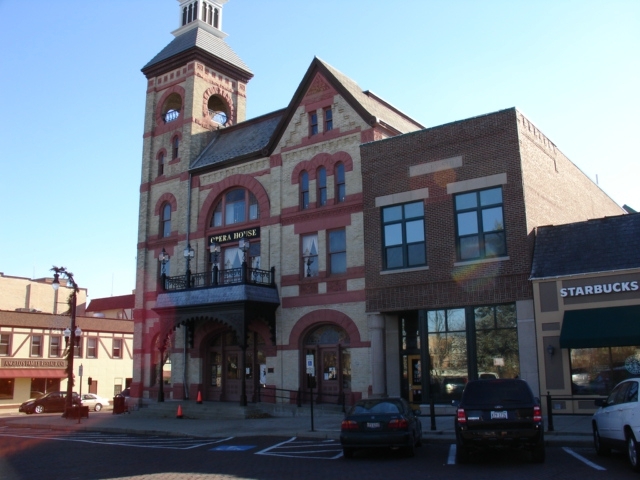 This building is actually an opera house in Woodstock, Illinois. Local legend has it that a ghost of a young girl haunts the building since a girl once fell off of the balcony section inside the opera house and died.